Behavior–interaction–priority (BIP) is a component-based framework supporting rigorous design of embedded systems. BIP supports incremental design of large systems from atomic components that communicate via connectors and whose interactions can be described with a powerful algebra. This paper presents SBIP, an extension of BIP for stochastic systems. SBIP offers the possibility to add stochastic information to atomic component’s behaviors, and hence to the entire system. Atomic component’s semantics in SBIP is described by Markov Chains. We show that the semantics of the entire system is described by a Markov chain, showing that the non-determinism arising from system interactions is automatically eliminated by BIP. This allows us to verify systems described in SBIP with Statistical Model Checking. 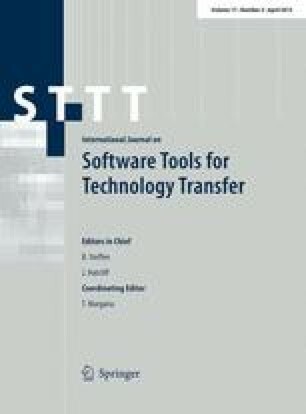 This paper introduces SBIP and illustrates its usability on several industrial case studies. A preliminary version of this paper was published in , and the present submission is a special issue extension from . The main differences between  and the present paper are: the extension of the background section, a complete description of the stochastic semantic of SBIP (including operational rules), a tutorial on how to use SBIP, and new experimental results. Research supported by the European Community’s Seventh Framework Program [FP7] under grant agreements no. 288175 (CERTAINTY), no. 288917 (DALI), no. 287716 (DANSE), no. 257414 (ASCENS), the ARTEMIS AIPP grant agreement no. 332987 (ARROWHEAD), and Regional CREATIVE project ESTASE.